Humble Pie Farm grows beautiful, in season flowers for the local Twin Cities region. Jennifer and Mike's mission is to nourish your spirit and body with local flowers and food grown with love on their family farm. The first apple trees were planted on Whistling Well Farm in 1980 by Carol and Charlie Johnson, along with their sons Chad and Neal. 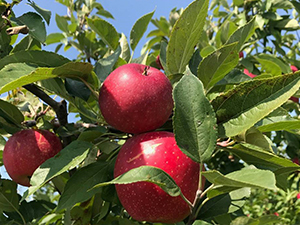 Today Whistling Well is a family-friendly pick-your-own apple orchard and pumpkin farm located in the beautiful St. Croix River Valley. Sacred Blossom Farm is a polyculture herb farm dedicated to sustainably growing and drying the highest quality botanicals. They grow in mixed plantings, the way you would find in nature, then hand harvest and dry in small batches to preserve the medicinal benefits and exquisite flavor. White Pine Berry Farm is an organic pick-your-own berry farm owned by Greg and Irma Zwald. They believe it is a joy to have families come to share the farming experience picking berries on their farm.